Given the success of Metro: Last Light, it should come as no surprise that the game has a host of DLC on the way. This morning the official 4A Games Twitter account detailed the studio's plans for upcoming Metro: Last Light DLC as well as the game's Season Pass initiative. If that seems like a whole lot of information to stuff into 140 characters, you're right. It is. Even using TwitLonger, this seems like the most convoluted possible way to drop a press release. That said, the information contained in 4A's "tweet" should come as good news to fans of Metro: Last Light. "Artyom's story may have been concluded in Metro: Last Light, but there are other characters with stories to tell, some familiar locations that fans of the Metro series wanted to revisit, and some new challenges that 4A wanted to explore," says creative director Andrew Prokhorov. "Since completing the game we have been working on these new stories and hope to release them throughout the summer." 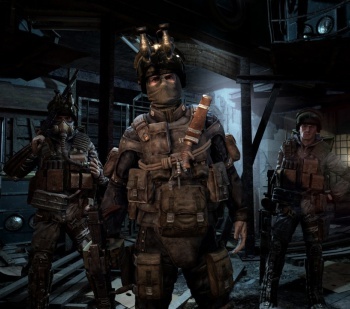 The Faction Pack and the Chronicles Pack, which both focus on new and original single player gameplay and stories that expand upon the Metro: Last Light universe. The Tower Pack focuses on challenge and pure gameplay for Metro veterans. The Developer Pack will give creative players some interesting tools with which to explore the world of Metro. In addition to these different individual Packs, the Season Pass includes the Absats weapon - a buckshot-firing heavy machine gun - ready for use in the Metro! As you'd expect, that $15 price tag is a discounted price compared to buying each of these DLC releases individually. We don't know how much of a discount it is though, as 4A claims that it's not yet ready to reveal that information. However, it does state that the aforementioned Faction Pack will be released in June with the remaining DLC additions scheduled to follow "throughout this Summer."